OSAKA - Nara voters head to the polls Sunday for a mayoral election that has been dominated by concerns over a shrinking population and an expanding tourist industry. Three candidates are challenging incumbent Mayor Gen Nakagawa, 41, who is seeking a third term. His main rivals are Makoto Yamashita, 49, a former candidate for Nara governor running as an independent, and Yoshiko Asahiro, 56, an NPO leader backed by the local chapter of the Liberal Democratic Party. The third candidate is Yoshiko Inoue, 53, who has the support of the Japan Communist Party. Nakagawa originally ran with support from the Democratic Party when he first won the mayor’s seat in 2009. Yamashita was mayor of neighboring Ikoma from 2006 to 2015, when he resigned and ran in Nara with Democratic Party support but failed to secure a victory. Two main issues of concern on the campaign trail have been stopping population decline, dealing with the elderly, and creating a transportation and hospitality infrastructure that can deal with an ever-increasing number of tourists. “To deal with the population decline, we have to invest now in Nara’s future generation, and that means better child care. Eight years ago, when I first became mayor, there were 65 children waiting to get into day care centers. While nearly 600 child day care centers have been added, we’re still trying to address the demand for nursery care. But within two years, I am aiming to bring the number of children waiting to zero,” Nakagawa wrote in his manifesto, released Sunday. Between 2010 and 2015, according to data from the Nara Municipal Government, the city’s population declined to 355,000 from about 368,000. A 2015 estimate by the National Institute of Population and Social Security Research predicts that by 2040, the population will have shrunk to around 288,000. To deal with the problem, candidates are focusing on child care provision and the primary school education environment, in the hope of attracting younger couples. Yamashita has proposed city guidelines and rules for internet usage, social media, and online games at elementary and junior high schools. Nakagawa, running on his record, is emphasizing more effort on increasing the number of day care center employees so that, by 2019, no child will have to wait to get into a city-run facility. Asahiro and Inoue have also vowed to eliminate waiting lists for day care centers. 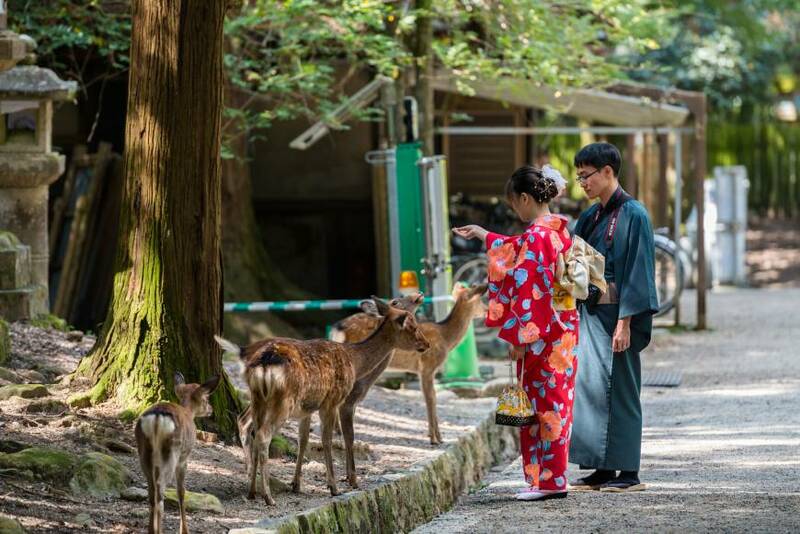 Like neighboring Kyoto, the city of Nara — which was Japan’s capital from 710 to 794 and is home to numerous World Heritage sites — has seen huge growth in tourism over the past few years. But with old and narrow access roads, and few top-class hotels, the city is still trying to upgrade its service industries with foreign visitors in mind. According to the Nara Municipal Government, nearly 15 million people visited the city in 2015, including 975,000 from abroad. 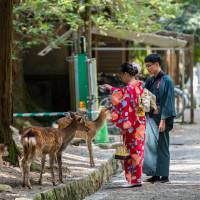 But only 1.6 million visitors stayed in Nara for the night. The rest came to the city on day trips, often due to a lack of lodging and a focus in travel company promotions on tours of Kyoto and Osaka. Nakagawa is proposing more exchanges with other countries in Asia and more emphasis on Nara’s history in relation to the Silk Road, as well as support for better rail access. Yamashita wants to relax city restrictions on the use of abandoned houses and traditional machiya (traditional wooden houses), so they can be turned into lodging facilities. Asahiro is proposing more sporting events to attract visitors, while Inoue has urged for environmental concerns to be addressed as a way to bring in more people. While Nakagawa and Yamashita are considered the front-runners, voter turnout will be key. Turnout for the 2013 election was over 60 percent. But, unlike the forthcoming contest, the 2013 vote was held the same day as an Upper House election.